Like the better-known Smilodon, or saber-tooth cat, the scimitar-tooth cats of the New World were fierce predators that killed and consumed the largest of North America's species. This volume synthesizes all currently known information about the scimitar-tooth s.
Scimitar-tooth cats had serrated teeth that were shorter and stouter than those of Smilodon. Using a mix of new research and previously published accounts, the contributors examine all aspects of the natural history of these extinct cats. They reconstruct what scimitar-tooth cats might have looked like, discuss how they captured and killed prey, and describe their worldwide distribution and how they interacted with other, non-prey animals. Highly detailed descriptions reveal the biology of these cats, provide bone-by-bone comparisons of them to Smilodon and other cat-like carnivores, explain how they originated, and set them in an evolutionary context. 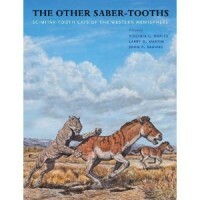 Richly illustrated and featuring the latest information on scimitar-tooth cats of the New World, The Other Saber-tooths is an engaging and comprehensive collection of information about these fascinating felines that will appeal to paleontologists and anyone else interested in the prehistoric world. Virginia L. Naples is a professor of biology at Northern Illinois University, DeKalb. Larry D. Martin is a professor of ecology and evolutionary biology and the senior curator of vertebrate paleontology at the University of Kansas. John P. Babiarz is the president of the Babiarz Institute of Paleontological Studies.